I’ve mentioned in past reviews about how I take great care in choosing car seats for my kids. The seats in my car, as well as in my husband’s car, have been researched, talked about, and came highly recommended from people and brands I trust. I feel good knowing my kids are safe in our cars with the seats we have. So when the opportunity to review a new car seat from Snugli came along, I wanted to make sure it fit in with my high standards before we put it to use. 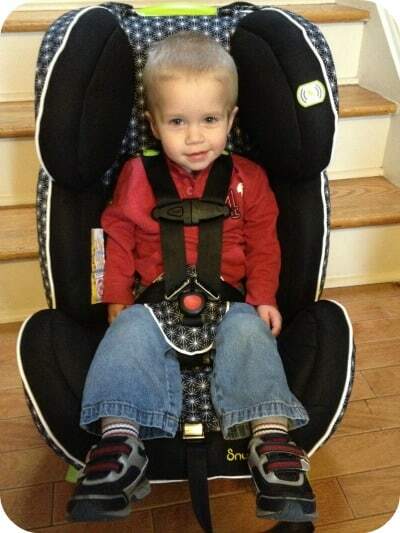 I received a Snugli All-In-One Car Seat in the Starburst pattern for review. This seat has some really great features, including three layers of foam to reduce the impact of side crashes and memory foam for comfort. The seat also has a feature that my husband is a big fan of – you can access the harnesses through an opening in the middle of the seat, which means you don’t need to take off the cover to switch from rear to forward facing, and you don’t need to re-thread the straps to adjust the shoulder harnesses. We thought this seat would be a good fit for my almost-two-year-old son, Noah. Not only was Noah happy sitting in the seat, but I think it’s a great fit for his size. I took a picture of him in the seat before we put it in the car so that you could really see the fit and size. Installation took a matter of minutes. The LATCH connectors and the TruTether straps made the process pretty easy. I feel good knowing that Noah is safe riding in this car seat and that he’s comfortable too thanks to the comfort cooling fabric which absorbs and stores extra heat. 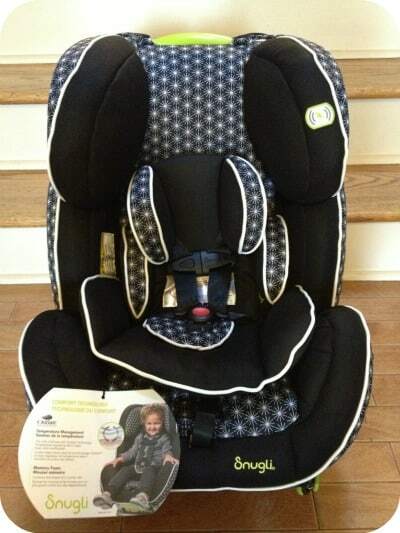 The Snugli All-In-One Car Seat has an MSRP of $329.99 and is available through their online retail partners. This is a great price for a seat that will last from rear-facing newborn use to a toddler booster, accommodating a child up to 110 pounds. As the child of parent company Evenflo, Snugli offers a full line of baby gear with style – from car seats to strollers, carriers and high chairs. Snugli has partnered with designer Jennifer DeLonge in an effort to combine safety with modern style. You can check out the full Snugli line on their website. While you’re there, sign up for their newsletter to stay on top of the latest news and products from Snugli. You can also keep up with them on Facebook, Twitter, and Pinterest. 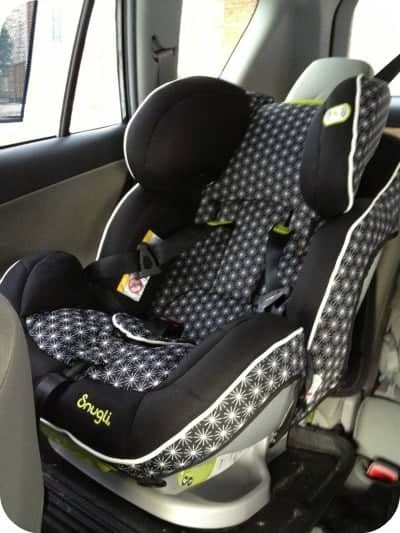 My daughter is growing out of her rear facing car seat which was a gift to us that only goes up to 22 pounds, so I am looking for a good, safe, quality car seat that she can use until she can go to just a seat belt. 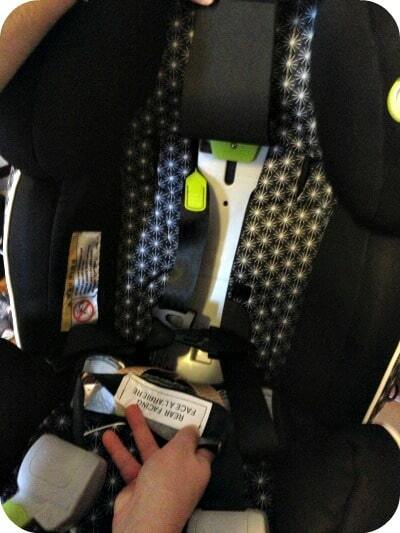 I will definitely be looking into this car seat, so thanks! This looks like a great, durable car seat. We only have an infant car seat at the moment, and need to upgrade soon. I like that is has three layers of foam for extra support. Car seats are much nicer and safer then when my kids were little. I like how this one has three layers of foam to reduce the impact of side crashes. Great review. I love that it’s safe and comfy! Aww he looks so comfy. It sounds very handy and safe. I am looking at all sorts of car seats for a friends baby shower. This review gives me a lot compare and a lot of great info. Thanks you. My sister-in-law is expecting. This would make a fantastic baby shower gift. I’m glad you take such care in choosing a car seat. It is very important that it is safe and fits your baby or child well. It sounds like this one is user friendly and will last. Baby seats have come a long way since the days I needed them. Everything is put into consideration. Ultimate safety, growth of the baby and fashion. I love that this is an all in one carseat that can be used for a newborn all the way up to a child who weighs 110 pounds! This is quite a carseat! I love the cushioning in case of a car accident. When I was growing up my folks never used car seats (1950s). Much safer now with these. I was looking at this carseat in the store. Did you find the lap buckles on this seat required additional force to engage compared to other brands? I’m concerned that I will not be able to successfully snap these closed when struggling with a kid who does not want to be in his seat. No, I don’t think they’re difficult at all – as a matter of fact, I would say they’re actually easier than the other seats I have. I recently purchased this car seat and I love everything about it, except that the head cushion seems to push my daughter’s head forward. It looks like your son’s head it pushed a little forward as well. Did he seem to be comfortable sitting like this for extended periods? Thanks. This has actually turned out to be a wonderful car seat for my Noah – he’s been in this seat for long trips to see my inlaws (5 hours plus), on vacations, etc. He seems very comfortable in it and I think we get longer stretches of napping from him in it. At two he’s pretty vocal about what he’s happy/unhappy about and he never complains about being in the seat. And he never gets that “head flop” when he falls asleep in this seat, which he used to in his other seat. Does your daughter seem uncomfortable in it? Have you tried more of a tilt in your car’s seat? As long as the seat base is parallel to the ground, try to see if adjusting your actual car’s seat help. I am very interested in this car seat but I have concerns about the size. I drive a smaller 4 door sedan (BMW 3 series), do you think it might be a problem to fit this seat? Hi Kim – I have a Toyota Rav4 and this seat fits great. I don’t think it would be an issue in your 3 Series. I am curious as to how you feel about the safety of this seat compared to the others that you have had in the past? One line of very well known seats goes on and on about the safety features, but I can’t find much in the information about the safety features of this car seat. I like the look of it and the fabric that helps reduce heat is very important to me living in Houston Texas, but I want to put safety first and if this one is just as safe, then I am sold. I just can’t find much info on the web about this seat.